You have likely heard the old saw that goes: no matter how long the legs, a 3-legged stool never wobbles. While true, sitting on such a stool can be uncomfortable. If the leg difference is large enough you will tend to slide off. Worse, if the legs are not symmetrically placed -- an equilateral triangle -- it could tip over and dump you onto the floor. The analogy is only fair yet the situation is not unlike the opportunistic guying of a tower -- the use of pre-existing objects to anchor the guy lines. Since that is what I am going to do for the Site-C tower let's use it as an example. As noted in an earlier article, the tower will be anchored by two mature trees with large trunks (spruce and tamarack) and a steel pipe coupled into the house frame. Although this configuration is not an equilateral triangle -- one where the interior angles are all 60° -- it can work fine if one goes about it in the right way. The ideal 3-guy configuration has the guy lines 120° apart (3 x 120° = 360°). You should not deviate much from this since a wider angle between any two guy lines increases instability -- at 180° it behaves like a 2-guy configuration. A small increase -- say, a maximum of 130° to 135° -- is okay, and can be compensated somewhat by increasing the guy line preload (tension under static load, without wind or other weather affects). We don't want too high a preload since it increases the stress, such as on the tower welds. This is a good reason to use the manufacturer's guy station hardware rather than connect the guy lines to the tower legs or cross members. I surveyed my yard, knowing that the configuration would not be an equilateral triangle, but would be close to an isosceles triangle. That is, the house anchor would be farther from the tower than the trees but would be an almost equal distance to both trees. This will work. 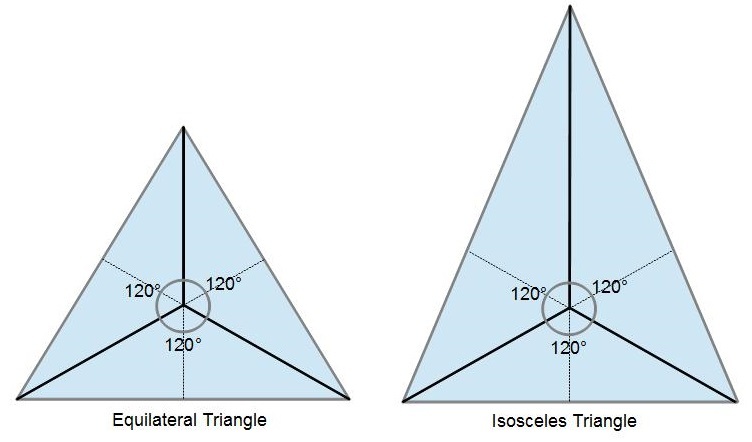 If you enjoy mathematics please note that there always exists a point within a triangular area from which lines to the triangle vertices are separated by exactly 120°, if you know how to find it! 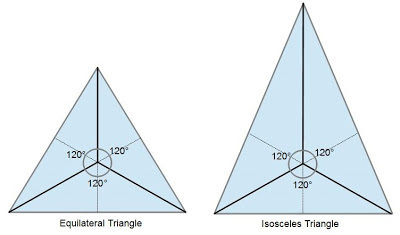 The constraint is that none of the triangle's interior angles can equal or exceed 120°. Get some paper, a protractor and a pencil and experiment. Keep in mind that there is an additional constraint, where the tower cannot be closer to a ground anchor than ~60% the height of the guy station to ensure that the guy is effective by keeping the angle between tower and guy line at least 30°. The angles between the tower and all the guys do not have to be equal, provided you adjust preload accordingly (I'll leave that as an exercise to the reader). 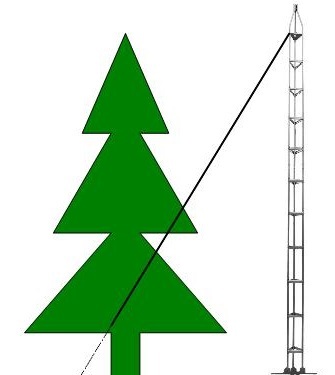 Since the triangle from my survey is not exactly isosceles the tower would have to be displaced slightly off the centre line of the triangle (line from the house anchor to the bisection point of the line between the trees) and a bit closer to one tree than the other. I may ignore this since the offset is only about 5°, thus keeping the tower centred in the yard. This leaves the most room for low-band delta loops. 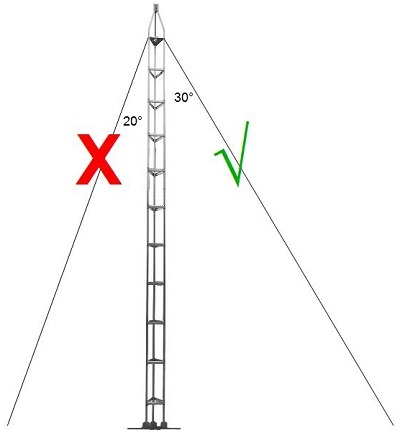 Another mathematical item: for small offsets (in the above, almost-isosceles case) you can get close to 120° guying by shifting the measured tower centre over to the long, bisecting line of the triangle (in my case, from the house-anchor vertex) on a line parallel to short (bisected) side of the triangle (line from tree to tree). 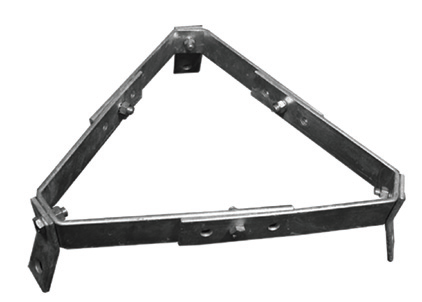 The house anchor could have been placed for better symmetry but at the cost of strength and reliability. 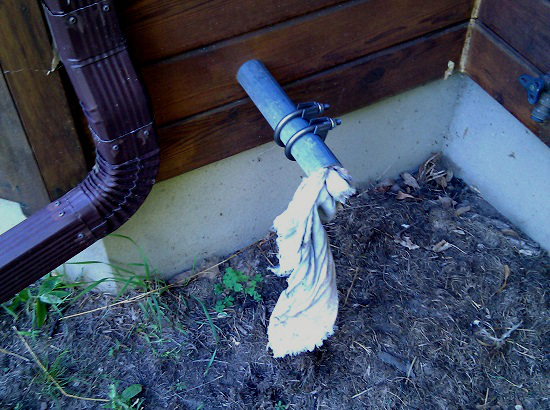 You can see the newly-installed pipe in the attached picture (complete with temporary varmint plug). I won't discuss how I've coupled it to the frame to avoid giving readers any ill-formed ideas about how to go about it. As built it easily withstands over 100 kg of force applied in any direction and should be good for much more. The pipe clamps are there to prevent the guy from slipping sideways. The guy will exit the photo towards the upper left, orthogonal to the pipe, towards the south. One final note on opportunistic anchoring regards height of the anchor above ground. All the anchor points in my design are above ground level. This requires additional measuring and calculation. It can actually help if the anchor (e.g. tree) is close to the tower since the angle between guy and tower increases as the anchor point on the tree is raised. Doing so does not affect the angles between guys, which remains at a nominal 120°. When I surveyed my yard I took special note of levels and anchor points on the trees and house. My yard was artificially raised for the installation of the septic system, which the trees predate. They are just outside this area and therefore their ground is about 1 meter below the level of the tower base. The anchor points on the trunks are higher yet. Their position was selected to be a compromise between getting lower on the trunk for maximum stability versus higher to use a thick branch as a natural retainer for the guy and to reduce interference from foliage along the guy line. The triangular area (as described above) must not use the anchor points as the triangle vertices. Instead we must project the guy to a virtual anchor point on the plane of the tower base. It is that intersection point that is the vertex to be used in our calculations. I hope to be in a position to raise the tower within the next week once I build the tower base and measure out the guy lines. I will have more to say about tower raising at that time.